Diet is one of the most important foundations of health. I believe in the concept of adding to the diet and filling your diet with health-promoting foods. 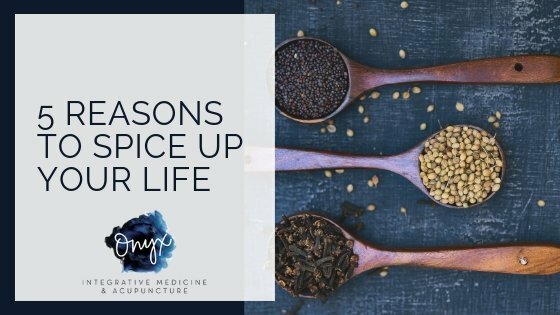 One aspect of dietary changes which can be easily incorporated yet is often overlooked, are culinary spices. Culinary spices do not only provide flavor, but they are also herbs which contain active constituents which have medicinal properties. Nature has provided us with these natural therapies to address numerous health concerns, including inflammation, high cholesterol, hormone balance, and mood. A warming and invigorating herb, which promotes circulation to small vessels such and those in the hands and feet, as well as the digestive tract. Cinnamon is a carminative which means it relaxes the muscles of the digestive tract, helping with gas and bloating after meals. Cinnamon is especially helpful in people with diabetes or metabolic syndrome. It helps to lower blood sugar by increasing the body’s sensitivity to insulin and it naturally lowers LDL cholesterol and triglycerides. A herb that is warm and fragrant, it acts as a nootropic – this means it increases blood flow to the brain, aiding in memory, focus, and well-being. It helps to prevent the degradation of the neurotransmitter acetylcholine, which is the used in the creation and storage of memories. In addition, it quenches oxidation in both the brain and heart. It is especially useful for the aging population, students, or anyone who is under a lot of mental stress. Rosemary is also a carminative, preventing gas and bloating after meals. Fennel is sweet, with a licorice-like flavor. When given to new mothers and passed through the breast milk, it is an effective herb for reducing colic in babies. It is also a galactagogue meaning it enhances milk production in new mothers. Fennel is a very effective carminative, dispelling gas and bloating when eaten after meals. Dandelion is usually thought of as a weed, however, both it’s roots and leaves have great therapeutic properties. The leaves are a potent diuretic assisting in water retention and high blood pressure. They are also a great source of potassium, which prescription diuretics typically deplete. The leaves can be incorporated into stir-fries or made into a tea. The root is a bitter, which aides in the production and flow of digestive enzymes and bile. Through increased bile flow, known as a cholegogue, dandelion root allows the excretion of metabolic wastes from the liver. This also stimulates regular bowel movements, also adding is waste excretion. Burdock root is flavorful with a woody and crunchy texture. It is often cooked into stir-fries or made into tea. It is known as an alterative, or blood purifier and through its abundance of antioxidants, such a quercitin, has the ability to remove free radicals from the body. It has an affinity for the skin, which makes it favorable for skin conditions such as acne, eczema and other rashes. It is a diuretic, which means it decreases water retention in situations such as high blood pressure and PMS. Burdock supports healthy gut flora as a prebiotic which is fuel for bacteria like bifidobacterium. Food is not only a source of energy and nutrients, it truly is medicine. Before reaching for nutritional and herbal supplements, consider expanding your diet to include culinary spices. Transforming your health can seem more challenging than it has to be. Understanding how dietary changes can positively or negatively impact your health is the first step in addressing any current health concerns as well as achieving and surpassing your wellness goals to become the best version of yourself.